And it’s back!! Your board loves you and we have once again designated Mike Weiss’s New Town Triathlon as our featured summer triathlon!! What’s in it for you? As we did last year, the board is subsidizing your entry fee by …….get this……50%!! Also, we again have swag!! The race is a local favorite featuring two race options and a flat and fast course suitable for both beginners to the sport and those who are aiming to set personal records. Club group training sessions and mentoring clinics will be scheduled to get you race-ready. Stay and cheer on your fellow members during the race and post-race at awards announcement time. We will have some snacks and drinks at the club tent to supplement the included post-race food and drink. Stick around for a group photo. Wear your tri club gear! If you race, New Town is worth double points in the Hogan Club Challenge. If you volunteer instead, you also get double points in the KolbeCo Volunteer Series. Everybody loves swag, especially those cool towels from last year. 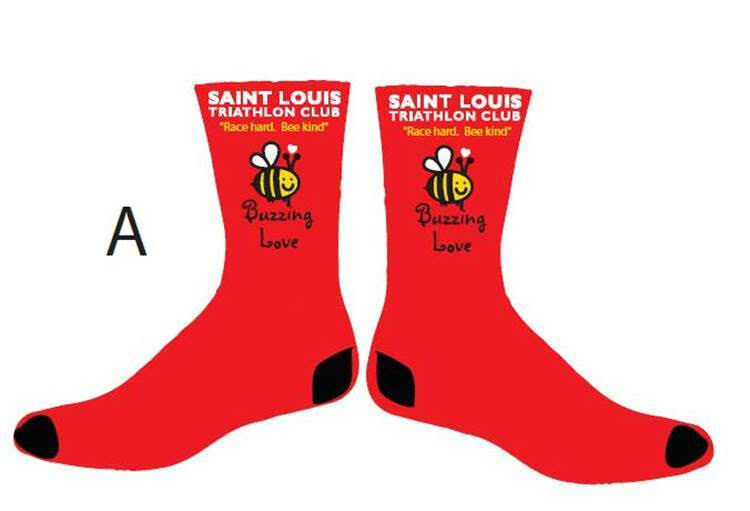 This year the club is partnering with Buzzing Love to provide socks (pictured below). These socks are the same type as the thick, stretchy, and comfy 2017 Frozen Buns Run socks. How do you get the socks you ask? Easy. Race or volunteer at New Town (either kids race on Saturday or adults race on Sunday). If you can’t attend New Town, we ask that you volunteer at two KolbeCo Volunteer Series events. Use the discount code below to save a total of 50% off your race entry fee. The discount is good for all adult categories, short, long, and relay teams. Use the code GOFAST (please don’t share, given today’s technology it is easy to track who uses what code lol) and you get 50% off your entry!! If you have already registered and ONLY got our 15% off through the club’s discount code, email your race receipt AND your home address to JP (juliepalmer56@webster.edu) and she will reimburse you the additional 35%!